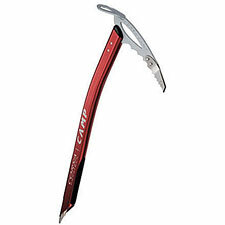 I was initially dismissive of Camp's 'Nanotech' Corsa ice axe. It struck me as gimmicky rather than functional, and that impression stuck even though I'd never actually seen one. That changed as soon as I got a up-close look at the Corsa Nanotech. The Nanotech's design begins with Camp's standard all-aluminum Corsa Ice Axe—perhaps the lightest functional ice axe on the planet. As ultralight gear goes, the basic Corsa is brilliant, but it's not an axe you want to be stuck with if your route turns unexpectedly icy. Enter the Corsa Nanotech. Camp has strategically added Sandvik Nanotech steel reinforcements to the axe. The Nanotech alloy is said to be 60% stronger than normal steel, allowing Camp to use less of it to reduce weight while still maintaining strength. Two individual Nanotech pieces replace the original Corsa's pick and spike, and are bolted in place to the axe's aluminum head and shaft. Additionally, Camp has changed the angle of the shaft to facilitate climbing, and added two sandpaper-like grip patches to the base of the shaft. The 9.8-ounce Corsa Nanotech thus becomes a very serious ice tool indeed. In hand, the Corsa Nanotech has a light but balanced feel. Unlike your typical aluminum axe, the points are sharp enough to do damage if you're not careful. The Nanotech points inspire confidence on terrain from rock to technical ice—quite an achievement for an aluminum axe. Which raises the one true concern with the Corsa Nanotech: how secure are those bolts going to be over the long haul? The nightmare scenario with the Nanotech would be climbing high on an icy mountain and suddenly hearing a little 'ping' as the steel-aluminum interface fails when you swing the axe against something hard. That would leave you on potentially technical ground with only the remnants of an aluminum pick to climb on. This shudder-worthy possibility (likelihood unknown) is dire enough to merit serious consideration. On any route where you'd feel comfortable with an all-aluminum axe, it seems reasonable to speculate you'd do no worse with the Corsa Nanotech in safety and reliability, with the added benefit of greater security if ice or mixed climbing pops up. The stickier question is whether or not you can replace your steel tool with the Corsa Nanotech. Ultimately, I leave that judgment to you. It would be foolish to expect the Nanotech to survive repeated, day-after-day hammering on rock and ice. However, cutting-edge climbers on big routes often make sacrifices to shed ounces. Certainly I'd carry the Nanotech as a backup without hesitation, or as a primary tool on short climbs where I felt there was a good escape route. Elsewhere, the Nanotech is best used on a route-by-route basis, carefully considering its strengths and weaknesses.